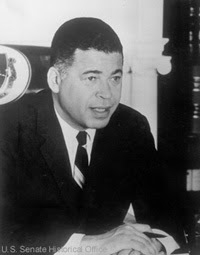 Edward William Brooke III (born October 26, 1919) is an American politician and was the first African American to be elected by popular vote to the United States Senate when he was elected as a Republican from Massachusetts in 1966, defeating his Democratic opponent, Endicott Peabody, 58%–42%. He was also the first African American elected since Reconstruction, and would remain the only person of African heritage sent to the Senate until Democrat Carol Moseley Braun in 1993. Brooke was born in Washington, D.C., 1919. Upon his graduation from Howard University in 1941, he spent five years as an officer in the segregated 366th Infantry Regiment and saw combat in Italy. Following his discharge, he graduated from Boston University Law School in 1948. The following year, he ran for a seat in the Massachusetts House of Representatives, but lost. He then made two more tries for office, including one for secretary of state, but again fell short in both races. After leaving the Senate, Brooke became the head of the Low Income Housing Coalition. In 1996, he became the first chairman of Alpha Phi Alpha's World Policy Council, a think tank whose purpose is to expand the fraternity's involvement in politics, and social and current policy to encompass international concerns. Brooke currently serves as the council's chairman emeritus and was honorary chairman at the Centennial Convention of Alpha Phi Alpha held in Washington, D.C in 2006. On June 20, 2000, a newly constructed Boston courthouse was dedicated in his honor. The Edward W. Brooke Courthouse is part of the Massachusetts Trial Court system, and houses Boston Municipal Court, Boston Juvenile Court, Family Court, and Boston Housing Court, among others. In September 2002, he was diagnosed with breast cancer and, since then, has assumed a national role in raising awareness of the disease among men. In 2004, Brooke was awarded the Presidential Medal of Freedom — designed to recognize individuals who have made "an especially meritorious contribution to the security or national interests of the United States, world peace, cultural or other significant public or private endeavors." The father of two daughters and a son, Brooke currently lives in Miami with his second wife, Anne.